For speeds, see Knot (unit). For the mathematical object, see Knot (mathematics). For other uses, see Knot (disambiguation). A knot is an intentional complication in cordage which may be useful or decorative. Practical knots may be classified as hitches, bends, splices, or knots. A hitch fastens a rope to another object; a bend unites two rope ends; a splice is a multi-strand bend or loop. A knot in the strictest sense serves as a stopper or knob at the end of a rope to keep that end from slipping through a grommet or eye. Knots have excited interest since ancient times for their practical uses, as well as their topological intricacy, studied in the area of mathematics known as knot theory. 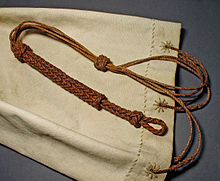 Sailor Bag with different knots. While some people can look at diagrams or photos and tie the illustrated knots, others learn best by watching how a knot is tied. Knot tying skills are often transmitted by sailors, scouts, climbers, canyoners, cavers, arborists, rescue professionals, stagehands, fishermen, linemen and surgeons. The International Guild of Knot Tyers is an organization dedicated to the promotion of knot tying. Truckers in need of securing a load may use a trucker's hitch, gaining mechanical advantage. Knots can save spelunkers from being buried under rock. Many knots can also be used as makeshift tools, for example, the bowline can be used as a rescue loop, and the munter hitch can be used for belaying. The diamond hitch was widely used to tie packages on to donkeys and mules. In hazardous environments such as mountains, knots are very important. In the event of someone falling into a ravine or a similar terrain feature, with the correct equipment and knowledge of knots a rappel system can be set up to lower a rescuer down to a casualty and set up a hauling system to allow a third individual to pull both the rescuer and the casualty out of the ravine. Further application of knots includes developing a high line, which is similar to a zip line, and which can be used to move supplies, injured people, or the untrained across rivers, crevices, or ravines. Note the systems mentioned typically require carabiners and the use of multiple appropriate knots. These knots include the bowline, double figure eight, munter hitch, munter mule, prusik, autoblock, and clove hitch. Thus any individual who goes into a mountainous environment should have basic knowledge of knots and knot systems to increase safety and the ability to undertake activities such as rappelling. Knots can be applied in combination to produce complex objects such as lanyards and netting. In ropework, the frayed end of a rope is held together by a type of knot called a whipping knot. Many types of textiles use knots to repair damage. Macramé, one kind of textile, is generated exclusively through the use of knotting, instead of knits, crochets, weaves or felting. Macramé can produce self-supporting three-dimensional textile structures, as well as flat work, and is often used ornamentally or decoratively. In most situations forming loops and bends with conventional knots is far more practical than using rope splices, even though the latter can maintain nearly the rope's full strength. Prudent users allow for a large safety margin in the strength of rope chosen for a task due to the weakening effects of knots, aging, damage, shock loading, etc. The working load limit of a rope is generally specified with a significant safety factor, up to 15:1 for critical applications. For life-threatening applications, other factors come into play. Even if the rope does not break, a knot may still fail to hold. Knots that hold firm under a variety of adverse conditions are said to be more secure than those that do not. Repeated, dynamic loads will cause virtually every knot to fail. The load creates tension that pulls the rope back through the knot in the direction of the load. If this continues far enough, the working end passes into the knot and the knot unravels and fails. This behavior can worsen when the knot is repeatedly strained and let slack, dragged over rough terrain, or repeatedly struck against hard objects such as masts and flagpoles. To capsize (or spill) a knot is to change its form and rearrange its parts, usually by pulling on specific ends in certain ways. When used inappropriately, some knots tend to capsize easily or even spontaneously. Often the capsized form of the knot offers little resistance to slipping or unraveling. A reef knot, when misused as a bend, can capsize dangerously. Knots differ in the effort required to untie them after loading. Knots that are very difficult to untie, such as the water knot, are said to "jam" or be jamming knots. Knots that come untied with less difficulty, such as the Zeppelin bend, are referred to as "non-jamming". A: open loop, B: closed loop, C: turn, D: round turn, E: two round turns. A bight is any curved section, slack part, or loop between the ends of a rope, string, or yarn. A curve narrower than a bight but with separate ends. Two crossing points created by an extra twist in a loop or a circle. The standing end is the longer end of the rope not involved in the knot, often shown as unfinished. It is often (but not always) the end of the rope under load after the knot is complete. For example, when a clove hitch ties a boat to a pier, the end going to the boat is the standing end. Section of line between knot and the standing end (seen above). A turn or single turn is a curve with crossed legs. The active end of a line used in making the knot. May also be called the "running end", "live end", or "tag end". Section of line between knot and the working end. The list of knots is extensive, but common properties allow for a useful system of categorization. For example, loop knots share the attribute of having some kind of an anchor point constructed on the standing end (such as a loop or overhand knot) into which the working end is easily hitched, using a round turn. An example of this is the bowline. Constricting knots often rely on friction to cinch down tight on loose bundles; an example is the Miller's knot. Knots may belong to more than one category. Knots used to tie up lines for storage. A knot used to hold (usually) poles together. A knot tied to hold a line through a hole. Grief knot. The starkly differing behavior of the knot, depending on how it is arranged, has been exploited as the basis of a parlor trick. When pulling on the standing ends the knot starts slipping and the working ends become crossed. By twisting the working ends so that they uncross and then recross in reverse, the knot's structure capsizes so that it will no longer slip. The twisting motion resembles the turning of a key, "locking" and "unlocking" the knot. Tom fool's knot, used as a trick knot due to the speed with which it can be made. Knot theory is a branch of topology. It deals with the mathematical analysis of knots, their structure and properties, and with the relationships between different knots. In topology, a knot is a figure consisting of a single loop with any number of crossing or knotted elements: a closed curve in space which may be moved around so long as its strands never pass through each other. As a closed loop, a mathematical knot has no proper ends, and cannot be undone or untied; however, any physical knot in a piece of string can be thought of as a mathematical knot by fusing the two ends. A configuration of several knots winding around each other is called a link. Various mathematical techniques are used to classify and distinguish knots and links. For instance, the Alexander polynomial associates certain numbers with any given knot; these numbers are different for the trefoil knot, the figure-eight knot, and the unknot (a simple loop), showing that one cannot be moved into the other (without strands passing through each other). A simple mathematical theory of hitches has been proposed by Bayman and extended by Maddocks and Keller. It makes predictions that are approximately correct when tested empirically. No similarly successful theory has been developed for knots in general. 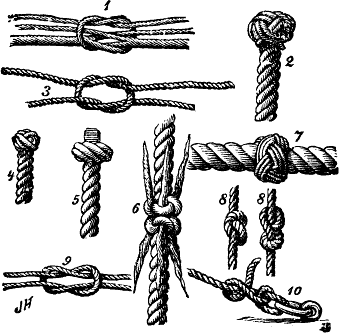 Knot tying consists of the techniques and skills employed in tying a knot in rope, nylon webbing, or other articles. The proper tying of a knot can be the difference between an attractive knot and a messy one, and occasionally life and death. It is important to understand the often subtle differences between what works, and what doesn't. For example, many knots "spill" or pull through, particularly if they are not "backed up," usually with a single or double overhand knot to make sure the end of the rope doesn't make its way through the main knot, causing all strength to be lost. The tying of a knot may be very straightforward (such as with an overhand knot), or it may be more complicated, such as a monkey's fist knot. Tying knots correctly requires an understanding of the type of material being tied (string, cord, monofilament line, kernmantle rope, or nylon webbing). For example, cotton string may be very small and easy to tie with lots of internal friction to keep it from falling apart once tied, while stiff 5/8" thick kernmantle rope will be very difficult to tie, and may be so slick as to tend to come apart once tied. The form of the material will influence the tying of a knot as well. Rope is round in cross-section, and has little dependence upon the manner in which the material is tied. Nylon webbing, on the other hand, is flat, and usually "tubular" in construction, meaning that it is spiral-woven, and has a hollow core. In order to retain as much of the strength as possible with webbing, the material must be tied "flat" such that parallel sections do not cross, and that the sections of webbing are not twisted when they cross each other within a knot. The crossing of strands is important when dealing with round rope in other knots; for example, the figure-eight loop loses strength when strands are crossed while the knot is being "finished" and tightened. Moreover, the standing end or the end from which the hauling will be done must have the greater radius of curvature in the finished knot to maximize the strength of the knot. Tools are sometimes employed in the finishing or untying of a knot, such as a fid, a tapered piece of wood that is often used in splicing. With the advent of wire rope, many other tools are used in the tying of "knots." However, for cordage and other non-metallic appliances, the tools used are generally limited to sharp edges or blades such as a sheepsfoot blade, occasionally a fine needle for proper whipping of laid rope, a hot cutter for nylon and other synthetic fibers, and (for larger ropes) a shoe for smoothing out large knots by rolling them on the ground. The hagfish is known to strip slime from its skin by tying itself into a simple overhand knot, and moving its body to make the knot travel toward the tail. It also uses this action in reverse (tail to head) to pry out flesh after biting into a carcass. ^ Richards, Dave (2005). "Knot Break Strength vs Rope Break Strength". Nylon Highway. Vertical Section of the National Speleological Society (50). Retrieved 2010-10-11. ^ "Knot & Rope Safety". Animated Knots by Grog. 2010. Archived from the original on April 7, 2015. Retrieved 2010-09-14. . "Knot & Rope Safety", AnimatedKnots.com. Accessed April 2016. ^ Daily-Diamond, Christopher A. (12 April 2017). "The roles of impact and inertia in the failure of a shoelace knot". Proceedings of the Royal Society. 473 (2200): 20160770. doi:10.1098/rspa.2016.0770. PMC 5415684. PMID 28484324. ^ Karl Fulves, Joseph K. Schmidt, Self-Working Rope Magic: 70 Foolproof Tricks (1990), page 17. ^ Nakanishi, Yasutaka; Okada, Yuki (2012). "Differences of Alexander polynomials for knots caused by a single crossing change". Topology and its Applications. 159 (4): 1016–1025. doi:10.1016/j.topol.2011.11.023. ^ Maddocks, J.H. and Keller, J. B., "Ropes in Equilibrium," SIAM J Appl. Math., 47 (1987), pp. 1185–1200. ^ "The physics of knots". www.lightandmatter.com.